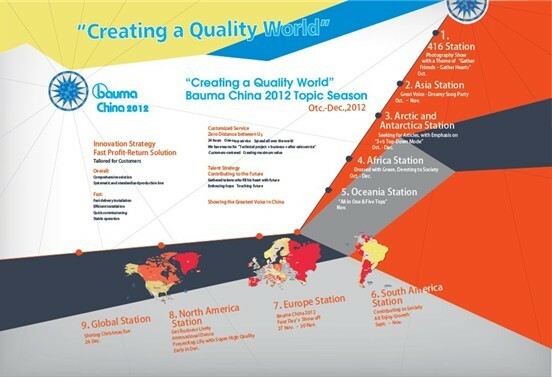 From November 27-30, 2012, bauma China 2012 will be held in Shanghai New International Expo Center. As "China’s first trade fair," bauma China adheres to the successful concept of the bauma Munich, meanwhile, it fully takes demands of the China and Asia market into account. "Born noble", bauma launched its debut in China since 2002. Its exhibition area extend gradually from 40,000 square meters to 150,000 square meters, then from 200,000 square meters to 300,000 square meters, all of these numbers show that bauma China is creating a legend in China Commercial Exhibition Industry. As the most valuable brand in China, and also in the mining and construction machinery industry, ZENITH witnessed the golden decade’s development in China construction machinery industry. According to the relevant data released from China Customs that, ZENITH has been holding its No.1 position on total export of mining machinery in the year of 2009-2011. Since the global financial crisis of 2008, ZENITH has still maintained its average annual growth rate on 38.2%. In the four days exhibition on bauma China 2010, ZENITH, with its double-layer booth of hundreds of square meters, has attracted lots of attentions from all over the world. Products valued more than 30,000,000RMB were reserved during this show. This year, Zenith will participate in bauma China 2012 with its exhibition area of 300 square meters, becoming the flagship booth of E5. This is the witness of strength, and also a self-confidence and pride based on ZENITH’s strength of R&D, its strength of high-quality products. 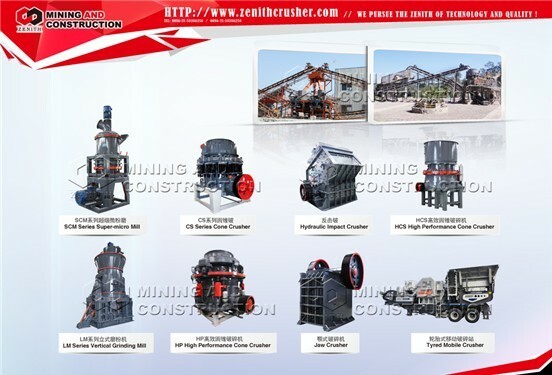 ZENITH will attend bauma China 2012 with its 7 types of star machines. HP Series Hydraulic Cone Crusher is one of the seven classic types. It adopts hydraulic automatic cleaning cavity, conducts overload protection, and centralizes lubrication to realize intelligent control. Besides that, Hydraulic-driven Track Mobile Plant will also be a shining type on this show. With its unique ship-form body, beautiful profile, and various kinds of hydraulic support, this type will definitely display a high performance, which will be more convenient to use, more reasonable for the process from screening section to crushing section. The other five types are also highlights in this show, which cannot be missed. In fact,ZENITH has always been a "star" on the famous exhibitions all over the world. Along with the enhancement of strength, ZENITH attracted more and more attention from media. Only in 2012, when it participated in a large international exhibition, ZENITH was twice reported as "the image of China". In recent, when it held its show in the 48th Zambia International Trade Exhibition, ZENITH was invited as the sole mining machinery company to be received by President of Zambia, Mr. Michael Sata, and also be interviewed by Zambia National TV. ZENITH marketing director ZhangYi said, "We always keep market demand as the foundation and power, which could impel company to continuously develop, and could stimulate innovation. With the professional technology, excellent quality of products and perfect service, ZENITH could give its promise to society and market". We also can see the highly praise from society, through honors such as "Famous product with high quality in China", "One of the most ten influence brands in China’s crushing machinery industry", "Unit of good quality and good faith".